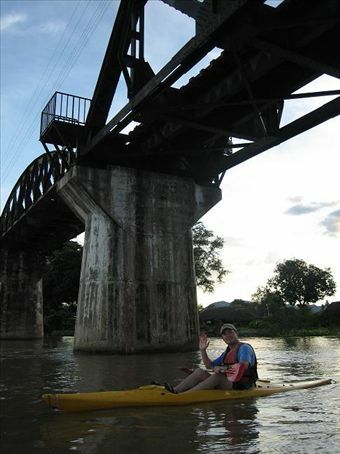 Under the Bridge...on the River Kwai! In 1942 Japanese and Koreans were the bain of the local and POW population as they attempted to do the near impossible and construct a 415 km railroad from Burma to Thailand via the infamous River Kwai and Hellfire Pass in just over a year. The end result, as we all now know, was a humanitarian disaster, which cost a life for every sleeper over the worst sections of railway. Over 60 years later, the tropical diseases don't seem to be so much of a problem, but Japanese and Koreans are still the bain of the River Kwai. Now they descend on the Bridge at Kanchanaburi like an umbrella weilding, white gloved horde from their air-conditioned tour buses. Ruthlessly jostling their way past any innocent bystanders, they storm onto the start of the bridge for their obligatory "everyone give the peace sign" photo, before swarming straight back onto their bus. It pissed me right off. The Bridge over the River Kwai, a place that is best appreciated in quiet reflection, has fallen prey to the mass tourism circus. I really hope this is not foreshadowing future experiences in similar sites around Asia and Europe, but I suspect that I am going to be disappointed. A quiet atmosphere was what we found at the Jeath War Museum, where orginal art and first hand accounts from POWs are sadly decaying into history in rather leaky replica POW hut. The POW cemetery however was a well kept, peaceful sanctuary, perfect to escape from the madness of Songkran that raged in the street around us. Exploring the area around Kancahanburi we boarded a raft for an overnight cruise down the river. This included a stop at the Tiger Cave temple (sans Tiger), and what was to be the first of many 'Buddha in a cave' stops in SE Asia. This one however came with the added attraction of a chained up pet monkey that will give your hair a complementary picking over and a kitch Chinese style dragon that has a staircase up its guts that you walk up into the temple. The next temple visit coincided with the culmination of Songkran in the village. After a spot of tradional dancing which resembled the Thai equivalent of line dancing, we joined the village in pouring water over local monks, who were looking decidedly cold after an hour of this despite it being 32 degrees! In similar heat the next day we beat a trail to the Erawan waterfall, a multi tiered setup, complete with fish, that like the monkey, gave you an all over cleaning (quite a bizarre feeling). We stopped breifly at the Tiger Temple where a group of Monks have 'taken in' many different kinds of animal after they have been 'saved from hunters'. Something smelled fishy in the whole setup to Cat and I, especially since the entrance fee has skyrocketed 6 fold in the past two years, and left us contemplating where the Buddhism ended and the Capitalism started. To round out our time in Kanchanaburi, I finally found a spot to contemplate the bidge on the River Kwai away from the tour groups. We cruised down the River Kwai and under the bridge in kayaks... the clamouring of the masses left way above us... the sun setting at our backs. Hey, just stumbled across your blog, I agree about the touristiness of the bridge, I found it disappointing. However, when I went to Hellfire Pass, it was a completely different story, that place was quiet and peaceful, and I was very moved walking through the cuttings and reading the stories in the museum.